No matter what time of year it is, I love working out in the garden. Here is a video of the state of things in the garden this weekend. 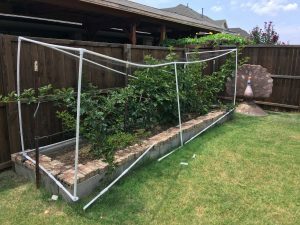 This weekend, one of my goals was to take down this broken PVC frame on which I draped bird netting to protect my blackberry bushes. The broken down PVC frame I took down this weekend. Everytime there is more than a slight breeze, it falls apart and is a pain in the neck. I bought some stands on gardeners.com that are made to suspend bird netting that I intended to put up and re-drape the bird netting, but while taking off the bird netting I had to cause so much damage to so many branches of the bushes that I really didn’t feel like putting it back on there. Birds are such a nuisance, but then so is bird netting. I’m starting to think that the solution is to only plant bushes with thorns that hopefully make it harder on the birds. So here is how the blackberry bushes look now. Blackberry bushes. Planted in my yard several months ago. I also intended to plant the two beds that are empty, but after I reviewed this list from Northaven Gardens, I decided to wait until Labor Day weekend to plant the beds. 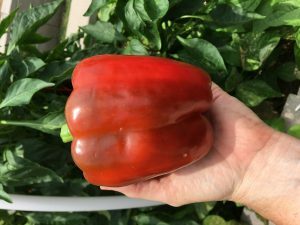 The timing will be better, and I won’t be staring down the barrel of several trips away from the garden. I’m harvesting a lot of peppers right now. Here is one I’m particularly proud of. Look how big this is! I’ll be on planes 6 out of the next 13 days. 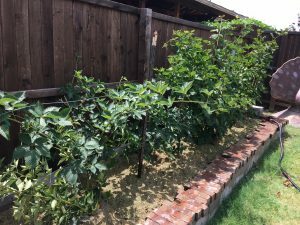 While I’m gone, I’ll write a post about how to manage a heavy travel schedule and still have a thriving garden. 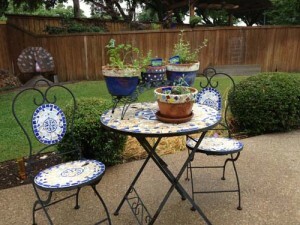 I was recently inspired by a post on a blog near and dear to my heart, “Addicted 2 Decorating”. 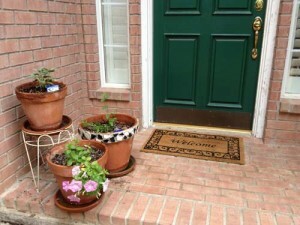 In the post, Kristi gathered some really good looking ideas for herb gardens. Also, I was prompted by the changing of the seasons and the need for me to refresh the flowers in the clay pots I have in various places. Add that to the fact that 4′ pots of herbs were on sale at Northaven Gardens, and I knew I had a plan. 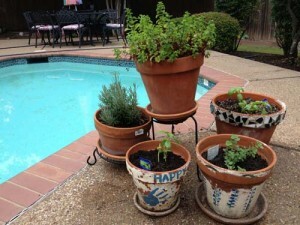 I decided to replace the flowers with herbs. 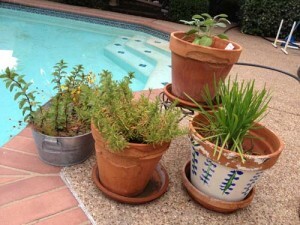 With herbs, I hopefully won’t have to replace them so often. Plus, I love the way they look AND they are useful to have around. So, here are pictures of what I did. Even by the front door! This is my plot at the school community garden. 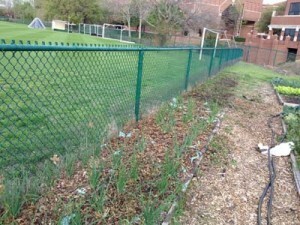 This is a picture of my plot at the community garden at my kid’s school. As you can see, it goes along the fence that separates the garden from the soccer fields. Our school does a great job at keeping those soccer fields looking just beautiful. The grass stays very healthy and tends to send shoots right through that chain link fence in an attempt to take over not only my plot but, I’m sure, the entire garden. Even though I am a vigilant and dedicated gardener, I just can’t keep the grass out of this bed. In the foreground of the picture you see onions. Further back you see just grass that has grown into the bed. I just arranged for this plot to have a raised bed built around it in order to raise it twelve inches. I’m hoping that this will make it harder on the grass, and easier on me. All of my other garden plots are raised beds and I don’t have nearly so many weeding issues as I do with this bed. I’ll keep you updated with progress.